South China Morning Post Published a Signed Article by Ambassador Liu Xiaoming Entitled "Hong Kong's continued prosperity depends on China "
On July 1, 1997, the Chinese government's sovereignty over Hong Kong was restored, ending over 100 years of separation from the motherland and heralding a new era of development for the city. Since then, thanks to the strong backing of the central government and the concerted efforts of 1.3 billion Chinese, Hong Kong has forged ahead to notch up remarkable achievements. The implementation of "one country, two systems" in Hong Kong has been a huge success. For 20 years, acting under the constitution and the Basic Law, the central government has stayed committed to the principles of "one country, two systems", "Hong Kong people administering Hong Kong" and a "high degree of autonomy". The capitalist system and way of life in Hong Kong have remained unchanged, and the legal system in general kept intact. The huge success of "one country, two systems" has been widely recognised, not only in Hong Kong but also in the wider international community. Hong Kong has made steady progress in democratic governance, as a result of the continuous efforts of both the central and SAR governments, in accordance with the Basic Law and the decisions of the National People's Congress Standing Committee. There is now greater democracy in the election of the chief executive and the Legislative Council, and citizens of Hong Kong enjoy unprecedented democratic rights and freedom. For years, Hong Kong has topped the world's Human Freedom Index and its world ranking in the rule of law rose from 60th place in 1996 to 11th place in 2015. Economic prosperity has continued despite three major tests in the past two decades: the Asian financial crisis of 1997, the severe acute respiratory syndrome epidemic of 2003 and the global financial crisis of 2008. 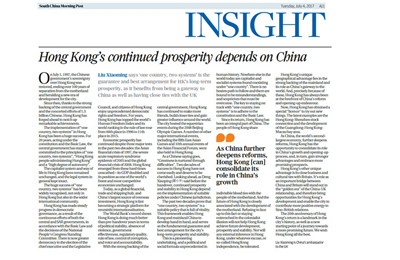 Hong Kong emerged from these hard times unscathed – its GDP doubled and its position as one of the world's freest and most competitive economies unchanged. Today, as a global financial, trade and shipping hub, and China's largest source of overseas investment, Hong Kong is fast becoming a strategic platform for renminbi internationalisation. The World Bank's record shows Hong Kong is doing much better than pre-handover years in terms of political stability, absence of violence, government effectiveness, regulatory quality, rule of law, control of corruption, and voice and accountability. With the strong backing of the central government, Hong Kong has continued to make more friends, build closer ties and gain greater influence around the world. The city hosted the equestrian events during the 2008 Beijing Olympic Games. A number of other major international events, including the fifth East Asian Games and 10th annual events of the Asian Financial Forum, were also held in Hong Kong. As a Chinese saying goes, "Greatness is nurtured through difficulties". Two decades of success in Hong Kong have not come easily and deserve to be cherished. Looking ahead, as Deng Xiaoping said before the handover, continued prosperity and stability in Hong Kong depend on the implementation of suitable policies under Chinese jurisdiction. The past two decades prove that "one country, two systems" is a suitable policy that is full of vitality. This framework enables Hong Kong and China's mainland to develop hand in hand, and serves as the fundamental guarantee and best arrangement for the city's long-term prosperity and stability. This is a pioneering undertaking, and a political and social formula unprecedented in human history. Nowhere else in the world today are capitalist and socialist systems found coexisting under "one country". There is no beaten path to follow and there are bound to be misunderstandings, and scepticism that must be overcome. The key to staying on track with "one country, two systems" is to adhere to the constitution and the Basic Law. Since its return, Hong Kong has been an integral part of China. The people of Hong Kong share indivisible blood ties with the people of the motherland. And the future of Hong Kong is closely associated with the development of the motherland. Refusing to face up to this fact or staying entrenched in the colonialist illusion will not help Hong Kong achieve future development, prosperity and stability. Nor will any external inference in Hong Kong, under whatever excuse, or so-called Hong Kong independence, be tolerated. Hong Kong's unique geographical advantage lies in the strong backing of China's mainland and its role as China's gateway to the world. And, precisely because of these, Hong Kong has always been at the forefront of China's reform and opening-up endeavour. Now, Hong Kong has obtained a special "licence" to try out new things. The latest examples are the Hong Kong-Shenzhen stock connection and the development of theGuangdong-Hong Kong-Macau bay area. As China, the world's second-largest economy, further deepens reforms, Hong Kong has the opportunity to consolidate its role in China's growth and opening-up process, and, in turn, gain stronger advantages and embrace more promising prospects. Hong Kong's other unique advantage is its close business and cultural ties with Britain. It's role as an important bridge between China and Britain will stand out in the "golden era" of the China-UK relationship, and therefore bring opportunities for Hong Kong's development and enable the city to contribute more positive energy to Sino-British relations. The 20th anniversary of Hong Kong's return is a landmark in the city's history, as well as a new starting point of a journey towards a more promising future. We wish Hong Kong all the best in the years ahead.